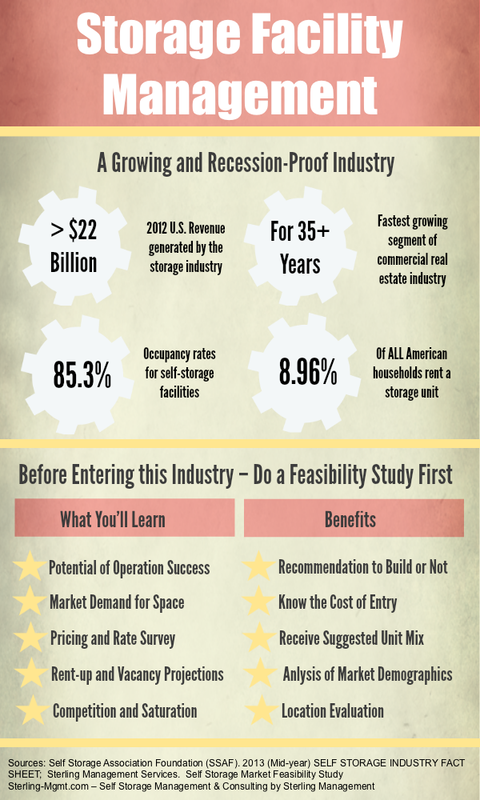 Storage facility management is a growing and recession-proof industry. We've organized some data to showcase how important the self-storage industry is. In 2012 alone, there was over $22 billion of revenue generated by the storage industry, and its been the fastest growing segment of commercial real estate for the past thirty-five years! Right now, occupancy rates are at an average of 85.3% nationally, and just under 9% of American households utilize a storage facility. While these data points represent industry trends and averages, its always recommended to speak to a storage facility consultant or perform a feasibility study for your geographic area if you are considering a move into the storage business.